This is the basic version of Masked Man @ Tobi. Tobi is actually Obito who was saved by old Uchiha Madara. The main aim to save Obito is to launch the Infinite Tsukuyomi genjutsu. Although it was achieved, Obito regretted over his action and fought along with Kakashi to stop reincarnated Uchiha Madara. Let’s take a look at abilities of Tobi. Taijutsu Iron Fist Sttack [Prompt]: Causes certain damage to a selected unit and will also cause the selected unit to suffer from High Combo and Ignition. Ninjutsu Minefield Jutsu: Attacks the opponent’s units in the front row and causes Ignition, this attack might also cause 2 COMBO and High Float. Ninjutsu Explosives Successfully Set: Chases and Attacks a Knocked Down unit, causes Ignition and Low Float. Ignores a given amount of Defense and Resistance. Ninjutsu Tangenan: Increases the chances of evading a Mystery Skill, can be triggered once each round. Ninjutsu Behind the Scenes: Before each action in a round, receives 20 Chakra points. 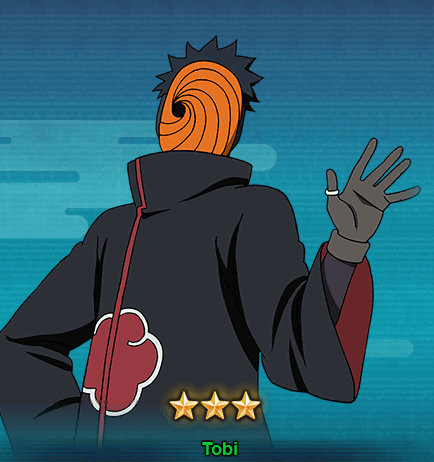 You can get Tobi for free when you complete Chapter 8. There are other ways to get Tobi as well.